Text-dependent questions are questions which can be answered directly from the passage being read. The reader does not need any outside tools or resources to answer text-dependent questions. A diligent scrutiny of the target chapter or the reading section will always provide the specific answer to each text-dependent question. Text-dependent questions focus the reader upon the author's ideas and are not open to the reader's interpretation. High-quality text-dependent questions force the reader to give attention to details and prevent the student from merely skimming the text. Developing the skills to carefully analyze reading material to find small details within a text is a principal goal of the Common Core State Standards, the K-12 academic standards used by most states in the United States. There are more than 7,000 questions with more than 12,000 parts in the Balancing the Sword books. 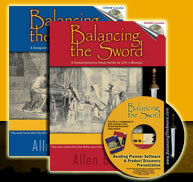 Every question in Balancing the Sword is a text-dependent question about a specific chapter of the Bible.